The Stevensons range of Porticos offers a choice of four options as standard. The P2 Houghton & The P2A Houghton – feature an apex detail for the canopy. The P3 Chatham canopy is horizontal. Downloadable CAD drawings will shortly be available giving full dimensional information. 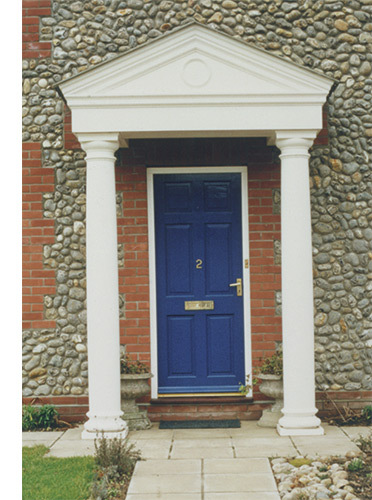 Columns available from the Stevensons range offer fluted or plain shafts with Ionic or Doric capitals. The columns are available in various heights and are correctly detailed in the classical manner following the guidelines established by James Gibbs (1682-1754). The standard finish for columns is a matt white. Alternative colours from the RAL or British Standard range can be offered on request. Porticos are finished in a gloss white and like the columns can be pigmented any RAL colour if preferred. Stevensons GRP does not require painting. If however a paint finish is required it can be applied following etch priming. It should be noted however that the ex mould finish if left unpainted is maintenance free.